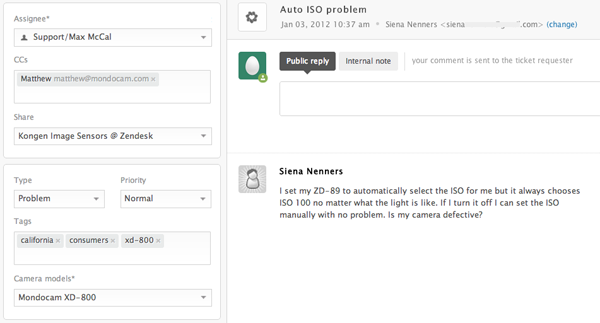 Typically, when end-users submit support requests, they provide the subject and description of their question or support issue. They may also be prompted to provide additional data such as a model number or product version using custom ticket fields. All of the other data in a ticket is set by you or behind the scenes using the business rules. Each of the standard ticket fields (referred to as system fields), those that are shown in the agent's view of the ticket page, are described below. You can manage your ticket fields in the Ticket Fields page. Click the Admin icon ( ) in the sidebar, then select Manage > Ticket Fields. Here you can deactivate and reactivate some of the system fields and add and manage your own custom fields. Additional system fields are added to the ticket page when you activate additional Zendesk Support features such as ticket sharing. Some system fields are inborn and cannot be reconfigured (see What are the inborn system ticket rules? in our Support Tech Notes). Note: Tickets contain other data that you can access using placeholders and the Zendesk API. For more information about this additional data, see Ticket data. Requester All tickets require a requester. The requester is the person who made the support request. If needed, the ticket requester can be changed to someone else. See Changing the ticket requester. You can also create a ticket on someone else's behalf. See Creating a ticket on behalf of the requester. The assignee can be set at the same time in Assignee field. Assignee The assignee can be either a group or a specific agent. See Manually assigning a ticket to yourself, another agent, or a group. CCs If you have been configured to allow it, other people can be CC'ed on tickets. Both the requester agents can add CCs to a ticket. The requester does it by adding CC email addresses if they requested support via your support email address. Agents can add CCs using the CC field when updating the ticket. See Copying someone else (CC) on a ticket. Share The Share field is only displayed if you have enabled ticket sharing, which means that tickets can be shared with other Zendesk Support accounts. See Sharing tickets. Subject The Subject field is required. It's typically included in the support request submitted by the requester. For example, when someone submits a support request via email, the subject line of the email is used as the ticket's subject. If the ticket title is not appearing in the ticket subject, your Subject field might not be visible to end users. To correct this, see this Support tech note. Description The description is required. This is the text of the support request. When an end-user submits a support request via email, the body of the email request is used as the description. The description becomes the first comment in the ticket. Status There are six values for status: New, Open, Pending, On-hold, Solved, Closed. A ticket's status can be set and updated either manually by an agent or automatically via your business rules. A ticket's status cannot be changed to Closed manually however; that is handled automatically via your business rules. New means that the request was received but that it has not been opened and has not been assigned to an agent. The New status can indicate that the support team is evaluating it to determine who should be assigned to resolve it. After changing the status from New to another status, you can't change the status back to New. Open means that the request has been assigned to an agent who is working to resolve it. Once a ticket status changes to Open, it can never return to New. If your tickets are being created in the Open status instead of New, see Why is my New ticket being created in Open status? in our Support Tech notes. Pending means that the assigned agent has a follow-up question for the requester. The agent may need more information about the support issue. Requests that are set to Pending typically remain that way until the requester responds and provides the information the agent needs to continue resolving the request. Solved means that the agent has resolved the support issue. Solved tickets are closed, typically, a number of days after they have been set to Solved (the exact number of days depends on how an Administrator set this up). Until a ticket is closed, the requester can reopen the ticket. For example, the requester may not agree with the agent that the support issue is resolved and reply back to the ticket solved email notification. Closed means that the ticket is complete and can't be reopened. Requesters however can create follow-up requests for closed requests. Type There are four values for type: Question, Incident, Problem, and Task. While the field can be blank initially (and through any number of updates), once you change the field to a specified type, you can't change it to blank again. Setting the type helps you to categorize your tickets, which you can then use in your workflow. For example, you can create views of tickets by their type. Question is used to indicate that the requester's issue is a question rather than a problem that needs to be solved. Incident is used for occurrences of a problem that affect more than one person. For example, if the wireless network in an office stops working, the problem will probably generate several support requests. Instead of handling each ticket separately, create one ticket describing the problem and set the type to Problem. Next, link the incident tickets to the problem ticket. When you solve the problem ticket, all of the linked incident tickets are solved too. Problem is used to indicate that the requester is having an issue with your product or service that needs to be resolved. Task is used when you want to assign the ticket as a task to a specific agent. When you select Task, you also set the Task Due Date which is 12pm in the account local timezone on the due date. Note: If you deactivate the Type field, all of your tickets will default to Incident. Priority There are four values for priority: Low, Normal, High, and Urgent. By default, all of these four values are available, but if you are an admin you can allow only the Normal and High values to appear by toggling field options under Admin > Manage > Ticket Fields > Priority/ Priority is not a required field, so you do not always need to select a value. How you weigh the priority of your tickets is up to you. You can add them manually. Tags can be added (and removed) automatically based on your business rules. Tags can be added to users and organizations and these tags are automatically added to tickets. Tags are flexible and powerful tools that can be used in many ways. For more information about tags, see Using tags in the Administrator Guide. In addition to these system ticket fields, tickets can also contain custom fields, which are used to gather additional information from the person who is requesting support. For example, you may add a custom field prompting them to select a product name or model number. Custom fields are added by administrators. For more information, see Adding and using custom ticket fields. How can I have a clickable URL in a field description? It seems like the [Type] field should have an option for "Communication", "Information", or "Updates". Is there an opportunity to add other values to the [Type] field. Ticket Type is a system field, and as such can't be modified. You definitely have the option to create your own custom drop-down field that better suits your workflow, though. You can find more information on that here: Adding and using custom ticket fields. Hi @Cyriac - I've been playing around with several options in making a clickable description field, but it just isn't something that can currently be done. Sorry if that's a bummer! I did find a request for this functionality here, so I would definitely suggest you add your interest! note A colleague made note of an support tip that should actually get you where you are looking to go @Cyriac! Please visit the following link for more information! Are there any implications to changing the Title or Tag? For example, if I update the title of a field option, will all previous tickets be updated with that new value, or will they be removed, or something else? Same question with the tag of a field option. Hey @Will! If you update a ticket field's title, then the title for this field on tickets (previous and new) will be updated, as the field itself is based off of its field ID. However, the value of this field should remain the same unless otherwise updated by an agent or admin (if it's still possible to update the ticket). If a field has added a tag to a ticket, and you rename the field's title, or the tag's title, the tag value on the ticket should remain the same. @Michael, is there an impact in Insights? I am pretty sure that Insights will now show two separate fields even though there is only one in Zendesk - Is that correct? Hey @Colin, thanks for reaching out! I'm currently investigating to confirm this and will follow up as soon as I have more information. Hi Colin, Michael gave me a heads up about this conversation so jumping in now! The answer depends on when the project was created - any projects created in the last few months have been getting a version of Insights that uses the ID of the field. So updating the field is fine as the ID remains the same. For pre-existing projects we've been migrating (much more slowly than I would have liked) to using the custom field IDs as well. We've re-focussed on this more recently to get all projects using the custom field ID approach instead. If you have a specific issue relating to custom field changes in Insights, please raise a ticket and we can take a look at it. Are there any plans to allow Administrators / Agents to update the 'Type' field? As it is a System field we're finding it restrictive having the 4 options that are available. This is not something that we have planned at the moment; your best option is still going to be to create a custom Type field with the options you wish to use. We do have a thread about this in our Product Feedback forum. It hasn't had any comments in a while, but I'd still encourage you to add your voice and use case to that thread. Our Product Managers see all of those posts and comments, and it's the best way to make sure they see your suggestions! You can find it here: Customize ticket type and ticket priority. I haven't had a chance to review the responses, but can you please explain why deactivating the Type field defaults all tickets to Incident? Disabling the Type field doesn't change the Type value of existing tickets. However, it will remove that field from your ticket form so it is no longer visible, and any new tickets created while Type is disabled will default to the type "Incident". As to the reasoning, the most common types would be Question or Incident, and I believe Incident is chosen because it covers more situations than Question. Do you anticipate that causing issues? Can I remove the description from a end user form? I have a type of form with just a series of check boxes and drop downs as I need very specific information from the end customer. The description they try to give is about 90% not useful and I would rather populate this via a trigger or not at all. Since it's a custom field, I'm not sure that it's possible. If it were, though, I imagine you'd only be able to do it with some custom JS magic. I hunted around the Community for some related posts but came up empty handed. Hopefully someone else will have some input! how can I create linked fileds? I mean some option in ticket would be linked with the fields that appeared to be the choice of the option. I'm not sure I understand what you're asking...are you looking for something like Conditional Fields? Can system field TYPE be populated with support form submission? You should be able to edit the properties of the field to make it visible to end-users. In your agent interface, go to your gear icon, scroll to Manage, and click on Ticket Fields. Click edit on the Type field line, and in the end-users section check the box next to Visible, which will make it so that your customers can see it. Once you've done that, you can also make it so your customers can set that field when they fill out the form, and even make it required upon submission. You're right. Once you've set a priority on a ticket, you can change it to any other priority, but you can't change it back to "-". I checked the Product Feedback area and didn't see any other posts with this suggestion, so I'd encourage you to hop over there and share your detailed use case! Thanks for coming back to share the link, Svend! Just wanted to know if different ticket forms for end users can be created for different organizations? Or will the ticket forms remain same? Can the visibility to end user be changed on the basis of organization? One of our other Community members share some JS code that will accomplish this for you, provided you're on the correct plan level. You can find it here: Hide an option in a custom dropdown field from end user on request form. Hope that helps! For new tickets, does the status automatically change from new to pending once an agent sends a reply email to the end-user/customer? @Nate not unless you have a trigger set up to do so. If the agent takes the ticket when they make the comment, it does change from New to Open. Otherwise, we manually click on Submit as Pending. I have a question about displaying the information in the ticket fields in the main body of the ticket. For example, in our case, we collect various pieces of information from the end user, URL's, troubleshooting steps etc, this information appears in each of the relevant fields on the left-hand side, agents have to scroll up and down and try to copy out those links in order to access them, it can be a little bit fiddly and not ideal. Is there any way to take certain information from ticket fields and display it in the body of the ticket form so it can be easily read? We thought we might be able to do this using the hide description piece of code but I'm stuck. Why are new tickets being created in Open status?